Not to be confused with Ramyeon, Lamian, Instant noodle, or Ramune. This article is about the Japanese noodle soup. For other uses, see Ramen (disambiguation). Ramen (/ˈrɑːmən/) (拉麺, ラーメン, rāmen, IPA: [ɾaꜜːmeɴ]) is a Japanese dish. 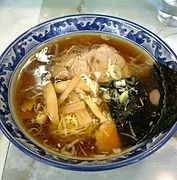 It consists of Chinese-style wheat noodles served in a meat or (occasionally) fish-based broth, often flavored with soy sauce or miso, and uses toppings such as sliced pork (叉焼, chāshū), nori (dried seaweed), menma, and scallions. Nearly every region in Japan has its own variation of ramen, such as the tonkotsu (pork bone broth) ramen of Kyushu and the miso ramen of Hokkaido. Ramen is a Japanese adaptation of Chinese wheat noodles. Ramen was first introduced to Japan in 1660s by Zhu Shun Shui. It was also said that Ramen was introduced by Chinese immigrants in the late 19th or early 20th century. According to the record of the Yokohama Ramen Museum, ramen originated in China and made its way over to Japan in 1859. Early versions were wheat noodles in broth topped with Chinese-style roast pork. The word ramen is a Japanese transcription of the Chinese lamian (拉麵). In 1910, a Chinese restaurant serving ramen in Yokohama's Chinatown received public praise in Japan. Until the 1950s, ramen was called shina soba (支那そば, literally "Chinese soba") but today chūka soba (中華そば, also meaning "Chinese soba") or just ramen (ラーメン) are more common, as the word "支那" (shina, meaning "China") has acquired a pejorative connotation. After Japan's defeat in World War II, the American military occupied the country from 1945 to 1952. In December 1945, Japan recorded its worst rice harvest in 42 years, which caused food shortages as Japan had drastically reduced rice production during the war as production shifted to colonies in China and Taiwan. The US flooded the market with cheap wheat flour to deal with food shortages. From 1948 to 1951, bread consumption in Japan increased from 262,121 tons to 611,784 tons, but wheat also found its way into ramen, which most Japanese ate at black market food vendors to survive as the government food distribution system ran about 20 days behind schedule. Although the Americans maintained Japan's wartime ban on outdoor food vending, flour was secretly diverted from commercial mills into the black markets, where nearly 90 percent of stalls were under the control of gangsters locally referred to as yakuza who extorted vendors for protection money. Thousands of ramen vendors were arrested during the occupation. In the same period, millions of Japanese troops returned from China and continental East Asia from their posts in the Second Sino-Japanese War. Some of them would have been familiar with wheat noodles. By 1950 wheat flour exchange controls were removed and restrictions on food vending loosened, which further boosted the number of ramen vendors: private companies even rented out yatai starter kits consisting of noodles, toppings, bowls, and chopsticks. Ramen yatai provided a rare opportunity for small scale postwar entrepreneurship. The Americans also aggressively advertised the nutritional benefits of wheat and animal protein. The combination of these factors caused wheat noodles to gain prominence in Japan's rice-based culture. Gradually, ramen became associated with urban life. In 1958, instant noodles were invented by Momofuku Ando, the Chinese-Japanese founder and chairman of Nissin Foods. Named the greatest Japanese invention of the 20th century in a Japanese poll, instant ramen allowed anyone to make an approximation of this dish simply by adding boiling water. Today ramen is arguably one of Japan's most popular foods, with Tokyo alone containing around 5,000 ramen shops, and more than 24,000 ramen shops across Japan. Tsuta, a ramen restaurant in Tokyo’s Sugamo district, received a Michelin star in December 2015. A wide variety of ramen exists in Japan, with geographical and vendor-specific differences even in varieties that share the same name. Ramen can be broadly categorized by its two main ingredients: noodles and broth. Most noodles are made from four basic ingredients: wheat flour, salt, water, and kansui (かん水) (from kansui (鹹水, salt water)) a type of alkaline mineral water, containing sodium carbonate and usually potassium carbonate, as well as sometimes a small amount of phosphoric acid. The kansui is the distinguishing ingredient in ramen noodles, and originated in Inner Mongolia, where some lakes contained large amounts of these minerals and whose water is said to be perfect for making these noodles. Making noodles with kansui lends them a yellowish hue as well as a firm texture. Eggs may also be substituted for kansui. Some noodles are made with neither eggs nor kansui and should only be used for yakisoba, as they have a weaker structure and are more prone to soaking up moisture and becoming extremely soft when served in soup. Ramen comes in various shapes and lengths. It may be thick, thin, or even ribbon-like, as well as straight or wrinkled. Traditionally Ramen noodles were made manually, but with growing popularity many Ramen restaurants prefer to have in-house capacity to produce fresh noodles to meet the increased demand and improve quality. Automatic Ramen making machines imitating manual production methods have been available since the mid. 20th century produced by such Japanese manufacturers as Yamato MFG. and others. Tonkotsu (豚骨, "pork bone"; not to be confused with tonkatsu) soup usually has a cloudy white colored broth. It is similar to the Chinese baitang (白湯) and has a thick broth made from boiling pork bones, fat, and collagen over high heat for many hours, which suffuses the broth with a hearty pork flavor and a creamy consistency that rivals milk, melted butter or gravy (depending on the shop). The resulting combination is generally divided into four categories. (although new and original variations often make this categorization less clear-cut) Described from old ones. Shōyu (醤油, "soy sauce") ramen has a clear brown broth, based on a chicken and vegetable (or sometimes fish or beef) stock with plenty of soy sauce added resulting in a soup that is tangy, salty, and savory yet still fairly light on the palate. Shōyu ramen usually has curly noodles rather than straight ones, but this is not always the case. It is often adorned with marinated bamboo shoots or menma, green onions, ninjin (carrot), kamaboko (fish cakes), nori (seaweed), boiled eggs, bean sprouts or black pepper; occasionally the soup will also contain chili oil or Chinese spices, and some shops serve sliced beef instead of the usual chāshū. 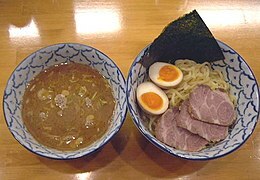 Shio (塩,"salt") ramen is the oldest of the four types. It has a pale, clear, yellowish broth made with plenty of salt and any combination of chicken, vegetables, fish, and seaweed. Occasionally pork bones are also used, but they are not boiled as long as they are for tonkotsu ramen, so the soup remains light and clear. Chāshū is sometimes swapped for lean chicken meatballs, and pickled plums and kamaboko (a slice of processed fish roll sometimes served as a frilly white circle with a pink or red spiral called narutomaki) are popular toppings as well. Noodle texture and thickness varies among shio ramen, but they are usually straight rather than curly. Miso (味噌) ramen is a relative newcomer, having reached national prominence around 1965. This uniquely Japanese ramen, which was developed in Hokkaido, features a broth that combines copious miso and is blended with oily chicken or fish broth – and sometimes with tonkotsu or lard – to create a thick, nutty, slightly sweet and very hearty soup. Miso ramen broth tends to have a robust, tangy flavor, so it stands up to a variety of flavorful toppings: spicy bean paste or tōbanjan (豆瓣醤), butter and corn, leeks, onions, bean sprouts, ground pork, cabbage, sesame seeds, white pepper, and chopped garlic are common. 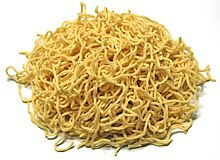 The noodles are typically thick, curly, and slightly chewy. Karē (カレー,"curry") ramen, ramen cooked with curry soup, is thought that was born spontaneously relatively recently in Japan. In Japan, several cities claim their origins. Muroran city claims, it occurred in there in 1965 (see also Muroran curry ramen). Also, Sanjō city claims, it founded over 80 years ago. Katori city claims also. Curry soup is mainly made with pork bones and vegetables and is seasoned with curry. The noodles are thick and curly. Toppings include chāshū, wakame, and bean sprouts. Seasonings commonly added to ramen are white pepper, black pepper, butter, chili pepper, sesame seeds, and crushed garlic. Soup recipes and methods of preparation tend to be closely guarded secrets. Most tonkotsu ramen restaurants offer a system known as kae-dama (替え玉), where customers who have finished their noodles can request a "refill" (for a few hundred yen more) to be put into their remaining soup. Sapporo, the capital of Hokkaido, is especially famous for its ramen. Most people in Japan associate Sapporo with its rich miso ramen, which was invented there and which is ideal for Hokkaido's harsh, snowy winters. Sapporo miso ramen is typically topped with sweetcorn, butter, bean sprouts, finely chopped pork, and garlic, and sometimes local seafood such as scallop, squid, and crab. Hakodate, another city of Hokkaido, is famous for its salt flavored ramen, while Asahikawa in the north of the island offers a soy sauce-flavored variation. 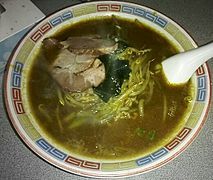 In Muroran, many ramen restaurants offer Muroran curry ramen. Kitakata ramen is known for its rather thick, flat, curly noodles served in a pork-and-niboshi broth. The area within the former city boundaries has the highest per-capita number of ramen establishments. Ramen has such prominence in the region that locally, the word soba usually refers to ramen, and not to actual soba which is referred to as nihon soba ("Japanese soba"). Tokyo style ramen consists of slightly thin, curly noodles served in a soy-flavored chicken broth. The Tokyo style broth typically has a touch of dashi, as old ramen establishments in Tokyo often originate from soba eateries. Standard toppings are chopped scallion, menma, sliced pork, kamaboko, egg, nori, and spinach. Ikebukuro, Ogikubo and Ebisu are three areas in Tokyo known for their ramen. 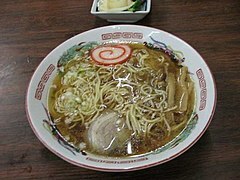 Yokohama ramen specialty is called Ie-kei (家系). It consists of thick, straight-ish noodles served in a soy flavored pork broth similar to tonkotsu. The standard toppings are roasted pork (chāshū), boiled spinach, sheets of nori, often with shredded Welsh onion (negi) and a soft or hard boiled egg. It is traditional for customers to call the softness of the noodles, the richness of the broth and the amount of oil they want. Wakayama ramen in the Kansai region has a broth made from soy sauce and pork bones. Hakata ramen originates from Hakata district of Fukuoka city in Kyushu. It has a rich, milky, pork-bone tonkotsu broth and rather thin, non-curly and resilient noodles. Often, distinctive toppings such as crushed garlic, beni shōga (pickled ginger), sesame seeds, and spicy pickled mustard greens (karashi takana) are left on tables for customers to serve themselves. Ramen stalls in Hakata and Tenjin are well-known within Japan. Recent trends have made Hakata ramen one of the most popular types in Japan, and several chain restaurants specializing in Hakata ramen can be found all over the country. There are a number of related, Chinese-influenced noodle dishes in Japan. The following are often served alongside ramen in ramen establishments. They do not include noodle dishes considered traditionally Japanese, such as soba or udon, which are almost never served in the same establishments as ramen. Nagasaki champon. The noodles are thicker than ramen but thinner than udon. Champon is topped with a variety of ingredients, mostly seafood, stir-fried and dressed in a starchy sauce. The stir-fried ingredients are poured directly over the cooked noodles, with the sauce acting as a soup. Tan-men is a mild, usually salt tasted soup, served with a mix of sauteed vegetables and seafood/pork. Not to be confused with the tantan-men (see after). Wantan-men has long straight noodles and wonton, served in a mild, usually salt tasted soup. Abura soba ("oil-noodles"). Essentially ramen and toppings served without the soup, but with a small quantity of oily soy-based sauce instead. Tsukemen ("dipping noodles"). The noodles and soup are served in separate bowls. The diner dips the noodles in the soup before eating. Can be served hot or chilled. Tantan-men (担担麺). Japanese version of dan dan noodles, a Sichuan specialty. Ramen in a reddish, spicy chili and sesame soup, usually containing minced pork, garnished with chopped scallion and chili and occasionally topped with the likes of spinach or Bok Choi (chingensai). Sūrātanmen or sanrātanmen (酸辣湯麺, "noodles in hot and sour soup") is very similar to Sichuan hot and sour soup served with long noodles. The topping ingredients are sauteed and a thickener is added, before the mix is poured on the soup and the noodles. Hiyashi-chūka (冷やし中華, "chilled Chinese"). Also known as reimen, esp. in western Japan. A summer dish of chilled ramen on a plate with various toppings (typically thin strips of omelette, ham, cucumber and tomato) and served with a vinegary soy dressing and karashi (Japanese mustard). It was first produced at the Ryutei, a Chinese restaurant in Sendai. Ramen is offered in various types of restaurants and locations including ramen shops, izakaya drinking establishments, lunch cafeterias, karaoke halls, and amusement parks. However, the best quality ramen is usually only available in specialist ramen-ya restaurants. Some restaurants also provide Halal ramen (using chicken) in Osaka and Kyoto. As ramen-ya restaurants offer mainly ramen dishes, they tend to lack variety in the menu. Besides ramen, some of the dishes generally available in a ramen-ya restaurant include other dishes from Japanese Chinese cuisine such as fried rice (called Chahan or Yakimeshi), gyoza (Chinese dumplings), and beer. Ramen-ya interiors are often filled with Chinese-inspired decorations. Ramen became popular in China, Hong Kong, and Taiwan where it is known as rìshì lāmiàn (日式拉麺, lit. "Japanese-style lamian"). Restaurant chains serve ramen alongside distinctly Japanese dishes, such as tempura and yakitori. Interestingly, in Japan, these dishes are not traditionally served with ramen, but gyoza, kara-age and others from Japanese Chinese cuisine. In Korea, ramen is called ramyeon (라면 / 拉麺). There are different varieties, such as kimchi-flavored ramyeon. While usually served with vegetables such as carrots and green onions, or eggs, some restaurants serve variations of ramyeon containing additional ingredients such as dumplings, tteok, or cheese as topping. Outside of Asia, there are restaurants specialising in Japanese-style foods like ramen noodles, especially in areas with a large demand for Asian cuisine. For example, Wagamama, a UK-based restaurant chain serving pan-Asian food, serves a ramen noodle soup. Jinya Ramen Bar serves tonkotsu ramen in the United States and Canada. Instant ramen noodles were exported from Japan by Nissin Foods starting in 1971, bearing the name "Oodles of Noodles". One year later, it was re-branded "Nissin Cup Noodles", packaged in a foam food container (It is referred to as Cup Ramen in Japan), and subsequently saw a growth in international sales. Over time, the term "ramen" became used in North America to refer to other instant noodles. While some research has claimed that consuming instant ramen two or more times a week increases the likelihood of developing heart disease and other conditions, including diabetes and stroke, especially in women, those claims have not been reproduced and no study has isolated instant ramen consumption as an aggravating factor. The Shin-Yokohama Raumen Museum is a unique museum about ramen, located in the Shin-Yokohama district of Kōhoku-ku, Yokohama. In Akihabara, vending machines distribute warm ramen in a steel can, known as ramen kan (らーめん缶). 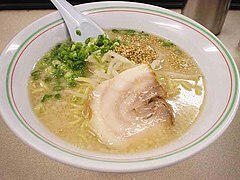 It is produced by a popular ramen restaurant and contains noodles, soup, menma, and pork. It is intended as a quick snack, and includes a small folded plastic fork. There are few kinds of flavor such as tonkotsu and curry. ^ "Ramen". Dictionary.com Unabridged. Random House. Retrieved 26 September 2013. ^ "Definition of "ramen"". The Collins American English Dictionary. Collins. Retrieved 26 September 2013. ^ a b Cwiertka, Katarzyna Joanna (2006). Modern Japanese cuisine: food, power and national identity. Reaktion Books. p. 144. ISBN 978-1-86189-298-0. However, Shina soba acquired the status of 'national' dish in Japan under a different name - rāmen. The change of name from Shina soba to rāmen took place during the 1950s and '60s. The word Shina, used historically in reference to China, acquired a pejorative connotation through its association with Japanese imperialist association in Asia and was replaced with the word Chūka, which derived from the Chinese name for the People's Republic. For a while, the term Chūka soba was used, but ultimately the name rāmen caught on, inspired by the chicken-flavored instant version of the dish that went on sale in 1958 and spread nationwide in no time. ^ a b c d e f g h i j k l m n o p q r s t u "How Did Ramen Become Popular?". Atlas Obscura. 2018. ^ Rupelle, Guy de la (2005). Kayak and land journeys in Ainu Mosir: Among the Ainu of Hokkaido. Lincoln, NE: iUniverse. p. 116. ISBN 978-0-595-34644-8. ^ a b NHK World. Japanology Plus: Ramen. 2014. Accessed 2015-03-08. ^ Okada, Tetsu (2002). ラーメンの誕生 [The birth of Ramen] (in Japanese). Chikuma Shobō. ISBN 978-4480059307. ^ Solt, George (22 February 2014). Untold History of Ramen. University of California Press. doi:10.1525/california/9780520277564.001.0001. ISBN 9780520277564. ^ Okuyama, Tadamasa (2003). 文化麺類学・ラーメン篇 [Cultural Noodle-logy;Ramen] (in Japanese). Akashi Shoten. ISBN 978-4750317922. ^ Kosuge, Keiko (1998). にっぽんラーメン物語 [Japanese Ramen Story] (in Japanese). Kodansha. ISBN 978-4062563024. ^ Kodansha encyclopedia of Japan, Volume 6 (1st ed.). Tokyo: Kodansha. 1983. p. 283. ISBN 978-0-87011-626-1. ^ Griffiths, Owen (29 August 2018). "Need, Greed, and Protest in Japan's Black Market, 1938-1949". Journal of Social History. 35 (4): 825–858. doi:10.1353/jsh.2002.0046. JSTOR 3790613. ^ a b Demetriou, Danielle (23 February 2016). "The holy grail of ramen dishes". BBC Travel. Retrieved 26 August 2018. ^ "Fusion of cultures nets stellar ramen at Ichimi". miamiherald. Retrieved 18 January 2019. ^ Davis, Elizabeth. "6 Glorious Types of Ramen You Should Know." Tastemade, 12 February 2016. ^ "Adventures in ramen: Japan's ever-changing soup scene". CNN Travel. 10 February 2015. Retrieved 8 March 2019. ^ "Major Ramen Powerhouse Well-Known Only to Those in the Know! The 5 Big Ramen in Niigata". WOW!JAPAN. NTT Docomo. 28 September 2017. Retrieved 8 March 2019. ^ "Kare Ramen". oksfood - Japanese Food Guide. Retrieved 8 March 2019. ^ ラーメンの具、トッピング選手権 [Ramen ingredient and topping ranking]. Oricon Style (in Japanese). 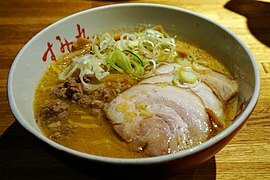 Oricon, Inc.
^ "Hakata Ramen (Nagahama Ramen) FAQ". Mukai.dameningen.org. Archived from the original on 1 April 2012. Retrieved 18 November 2012. ^ Nate (17 December 2009). "函館らーめん大門 (Hakodate Ramen Daimon)". Ramenate!. Retrieved 18 November 2012. 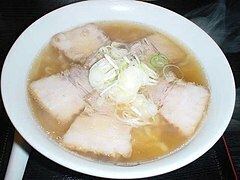 ^ "Asahikawa Travel: Asahikawa Ramen". japan-guide.com. Retrieved 26 September 2013. ^ 加盟店一覧　（50音順） (24 January 2013). "室蘭カレーラーメンの会 » 北海道ラーメン第４の味を目指して・・・". 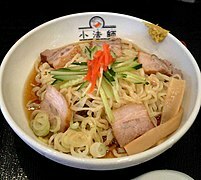 Muroran-curryramen.com. Retrieved 28 September 2015. ^ Hiufu Wong, Maggie (7 June 2013). "10 things that make Wakayama Japan's best kept secret". CNN Travel. Cable News Network. Turner Broadcasting System, Inc. Retrieved 22 November 2014. ^ "Harvard Study Reveals Just How Much Damage Instant Noodles Do to Your Body". Snopes.com. 6 July 2016. Retrieved 3 March 2017. ^ "Health Column: The risks behind those ramen noodles". 13 September 2014. Retrieved 31 January 2016. ^ "Ramen Museum". Retrieved 18 June 2008. Orkin, Ivan (2013). Ivan Ramen: Love, Obsession, and Recipes from Tokyo's Most Unlikely Noodle Joint. Berkeley, Calif.: Ten Speed Press. ISBN 9781607744467. OCLC 852399997. Retrieved 7 April 2014. "The art of the slurp (or, How to eat ramen)". The Splendid Table. 4 April 2014. Retrieved 7 April 2014. Interview with the author.